The new Pakistan Muslim League-Nawaz (PML-N) government, which had received praise from all quarters over the nomination of National Party’s Dr Abdul Malik Baloch as Balochistan chief minister, on Saturday received a serious reality check over the deteriorating security and law and order challenges of the province. Early on Saturday (around 1am), unidentified militants destroyed a historic building once used by the country’s founder, Muhammad Ali Jinnah, setting off widespread panic. Hours later, two bombs rocked Quetta and militants occupied a hospital complex, resulting in an armed battle that lasted over several hours, leaving over two dozen people dead. The suicide bombing occurred in a bus carrying female students. 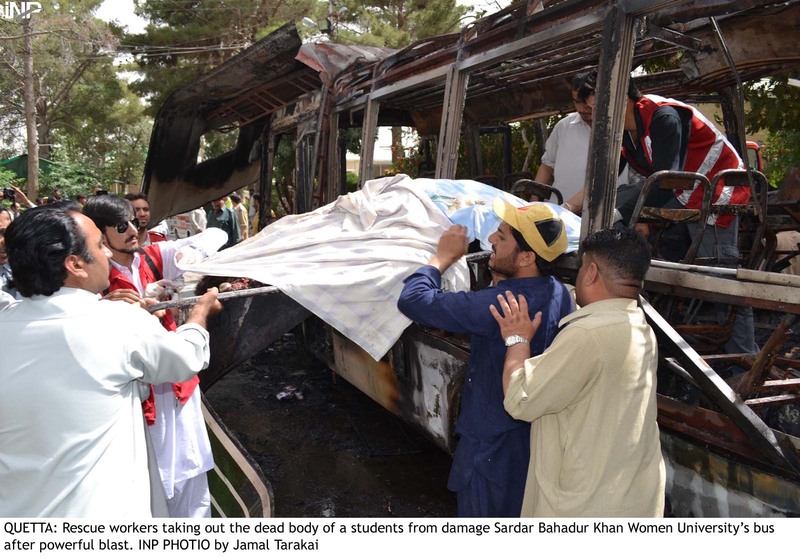 At least 11 female students were killed in the attack while the 19 injured were rushed to the Bolan Medical Complex. The tragic day was not over as the injured people drove straight into an ambush by militants, believed to be linked with Lashkar-e-Jhangvi (LJ). The second explosion targeted the Bolan Medical Complex, where the wounded were brought for treatment. At least 11 people died in a blast at the city hospital around 90 minutes after the first one. The day took another horrifying turn as a hostage crisis ensued in hospital. Senior Quetta officials were visiting the hospital when armed gunmen forced their way into the compound, leading to a heavy exchange of gunfire with security forces. Abdul Mansoor Kakar, the Quetta deputy commissioner, was killed as the gunmen took positions inside the medical complex. In the resultant battle that lasted three hours, four FC commandos were also killed. In official statements, Interior Minister Chaudhry Nisar said the bus bomb killed 14 students and wounded 19. Nisar said he was unable to give exact casualty figures of the hospital attack, but Abdul Wasey, spokesman for the paramilitary Frontier Corps earlier said 11 were killed and 17 wounded in the bombing. The brazen attacks shook the country and Prime Minister Nawaz Sharif instructed Interior Minister Chaudhry Nisar Ali Khan to provide assistance to the provincial government to control the situation. Nisar told reporters that four suspected terrorists were killed while one suspect was arrested alive during the operation. At least 10 to 12 militants attacked Jinnah’s Residency, as the building was called, in Ziarat, about 74 miles from Quetta. They used rockets and hand grenades, officials said, and a police guard was killed. Explosions caused a fire that quickly engulfed the two-storey building. The facade made of timber was turned to ashes. The Baloch Liberation Army (BLA), a militant separatist group that is fighting for the independence of mineral-rich southwestern Balochistan province, claimed responsibility for the attack. They also replaced the national flag at the building with a BLA flag. IT IS VERY SHAME ABLE AND PAINFUL INCIDENT IF HORIBLE AND STUPID ATTACKS ON THE RESIDENCY OF FOUNDER OF PAKISTAN.IT IS NOT ONLY A ATTACK ON RESIDENCY,BUT IS AN OPEN THREAT AND CHALLENGE TO PAKISTAN`S SECURITY.NO GOVERNMENT CAN EVEN GIVE SECURITY TO ORDINARY CITIZEN OF PAKISTAN.INDIA,ISRAEL AND AMERICA IS INVOLVED IN EXTREMIST ACTIVITIES IN PAKISTAN.THEY ALL ARE USING AFGHANISTAN IN BACKGROUND.IN PAKISTAN THERE MUST BE AT LEAST 3 DAYS MOURNING MUST BE OBSERVED.THE VISIT OF AMERICAN KERRY MUST BE BOYCOTTED AS BEFORE HIS VISIT TO PAKISTAN,THESE ACTIONS ARE THE SIGN OF HIS ARRIVAL IN PAKISTAN TO BE ALERT. Balochistan is still part of Pakistan and as far as I know the majority of people of this province want it to be this way. Do you really think people would want to give their future into the hands of the Marri/Bugti/Mengal clans who even don't do any good for their own tribes? It defies the logic when someone proposes that talks should be held with these terrorists. These cowards are killing innocent people. The country needs to buckle up for a long war with these cowards until they are completely eliminated. There is no other option. These criminal elements were tacitly supported by the PMLN and Imran Khan. Little do they realize that it is very easy to support terrorism but very difficult to contain this Jinne Once it is let lose. It is a very big challenge for the present govt. Forget blaming Israel, USA,and India. That is the excuse of fools. Blame your own country, your own leaders, and your own people. The citizens of Pakistan should be protesting in the streets demanding a return to law and order. Your leaders should be clamping down and destroying the terrorists when and where they can without hesitation. I guess life is cheap in Pakistan. I wish my family in Pakistan was living in Tel Aviv or New York. Muslims would be safer living there then in Pakistan!